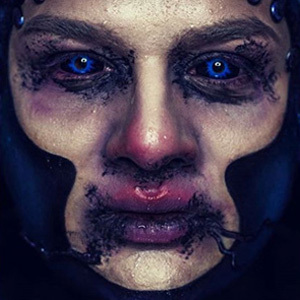 Mesmerizing and quite freaky black and blue scleral contact lenses from ColourVue. Thanos 22mm contacts are all you need for your dress up party. Contact lens case included. These full eye black and blue contact lenses aren't as horrific looking as the rest of them. In fact, they are quite nice! They bring galaxies or oceans to mind thanks to the irregular star shaped area surrounding your pupil. ColourVue Sclera Thanos 22mm contact lenses are designed with aliens and undersea creatures in mind, so if you're planning to turn into one, get a pair. If not, you can still order them as they'll go well with many costumes, from freaky fairy to blue dragon.